Shannon can’t speak French but you know who can? 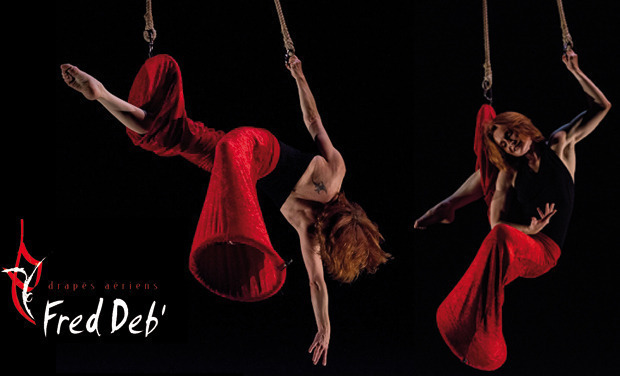 Aerialist, choreographer, and master teacher Fred Deb. Fred is one of the founders of aerial silks as an apparatus and has been called a “precursor to French contemporary circus.” In this episode, Shannon asks her about her career, the evolution of her teaching, and her creative process. Stay tuned after the interview to hear Shannon wrestle with the question of aerial dance vs circus. As one year passes into the next, many people reflect on what the next year of life should hold. Goal setting and New Year’s Resolutions abound! Some make it through the end of the year, but many of them fall to the wayside not long after the goal was set. There is a common idea for setting goals using the SMART formula. Goals should be Specific, Measurable, Appropriate, Realistic, and Timely. In the book Atomic Habits, by James Clear, he makes an argument against this being the most effective way of reaching your goals. As a math-oriented person that loves specific and methodical approaches, the dismantling of this goal setting notion made me very uncomfortable. After reading the book, I tell you what my circus friends, I am a believer! Below are a few tidbits from the book that really resonated with me and my relationship with training aerial. Most New Year’s Resolutions or SMART-formula goals are based on the Outcome level of change. This is an excellent start, but for lasting behavior change to occur and a habit to develop then addressing the next two levels is very important. Outcome level addresses what you GET if you achieve your goal. For many aspiring aerialists, those goals will be things like straight leg inversions, flat splits, or a Kerri Kresinski level windmill. Process level changes address what you DO to achieve your goal. This is where you must create a plan of action that will lead you to the results you desire. This is the level where habits begin. This is where the conditioning, stretching, or creation must be defined to carry you through to the finish line. Identity level change addresses what you BELIEVE. This is important because if you believe you are not a flexible person, then having a goal of becoming more flexible will always clash against your identity. The hard part about identity is that it is not a simple thing to change. One of the benefits of creating consistent habits (process level) is that they can lead you to identity reformation. If you don’t believe that you are a dancer, but proceed to dance every day for at least five minutes then you will start to create a track record that undeniably defines you as a dancer. One of the biggest things the book drives is that the outcomes you want will always be a lagging indicator of the habits you currently have. “Your net worth is a lagging measure of your financial habits, your weight is a lagging measure of your eating habits, your clutter is a lagging measure of your cleaning habits, your knowledge is a lagging measure of your learning habits.” For circus artists, your strength is a lagging measure of your conditioning habits, your flexibility is a lagging measure of your stretching habits, your endurance is a lagging measure of your airtime training habits. Don’t underestimate the importance of making small improvements daily. The first three steps will impact what happens THIS time, but the fourth step will determine what you do NEXT time. If the massage wasn’t helpful, it is less likely that you will try that method again. If the massage did help, then it will stay an option in your future to help with sore muscles. Using this pattern, we can use this loop to help modify our behavior to take on good habits or get rid of bad habits using the Four Laws of Behavior Change. In order to add a habit into our routine, these four steps will make it easier and help establish the plan of action needed for process level change. To initiate a habit, using environment design can help us make it obvious. Place a book on your pillow to read a page before bed, put your coffee mug on your yoga mat so that you must go to the space you do yoga before you can get coffee, pre-pack your gym clothes and put them in your car the night before work so that they are ready without thought the next morning. Change your environment so that it automatically cues you to begin. Making habits more attractive can be tricky. One of the things you can do is to pair a habit you NEED to do with a habit you WANT to do. In the book, the author refers to this trick as habit stacking. If there is something in your life that you already do all the time, use that frequent habit to insert another habit before/after it. EXAMPLE: In my life, I wake up every morning between 0630-0700 to let my dogs out. While I am in the process of walking through the kitchen, I will stop and take my thyroid pill. This is a habit stack that I had unconsciously designed into my life already but can use that same pattern to insert more habits in a similar way. The third rule is where I anticipated the book’s applications to fall apart. Circus is not easy and so clearly all my aspirations of being a contortionist were doomed. However, the habit doesn’t have to start out difficult. In fact, the author recommended that you scale down your goal to something you can do in two minutes or less. Once you have a two-minute habit established, you can grow it. EXAMPLE: I decided that when I was working after I finished editing a video and it was exporting, I would do ONE handstand drill in my office. I’ve been doing handstand training every day for a week now. It’s not the same as setting aside an hour to train them each day, but I’m doing it consistently where I have never been able to set aside an hour to train handstands at home before. Most of all, the habit doesn’t feel hard. A lot of time the habit done for two minutes can really set the stage for choices that follow. In the book, the author refers to this as a Gateway Habit. Maybe your habit is that when you get home from work, you put on running shoes. That takes less than two minutes, but can also decide how the next twenty minutes of your day goes even if in your mind you didn’t plan on running for twenty minutes. You just had to make the initiation easy enough to get started. The last rule of behavior change is also one of the most difficult. Satisfaction with a habit is usually based the time immediately following a response. Many of the rewards we are looking for in circus are very LONG term in nature. If there is no reward present immediately following our action, we will ultimately fall off the wagon. Creating an immediate reward that is satisfying after doing the habit you want to build is important. This is especially important because there are more structures in the brain for WANTING than for LIKING. We will crave things much easier than we will like them when we get them. If the reward isn’t there, our brain will crave a new approach even if what we are doing is working. Just make sure the reward fits your identity and personality. Don’t reward going to the gym with ice cream, that is an identity conflict. Don’t use a habit tracker if you are not into organization and documentation, that is a personality conflict. Sometimes the easiest way to reward yourself can be out loud, verbal praise like “I am the type of person who does the splits every day” will give the ego enough to feel rewarded with a habit. This part can be very personal and needs to be explored and thought out. “Incentives will start a habit, but identity will sustain it.” The habit needs to be rewarding enough to make it through enough repetitions to become part of your identity. One of the issues with establishing a habit is that eventually, you will become bored with it. Sometimes even with the right rewards and the alignment with our identity that we have created, we STILL won’t want to do “the thing.” This ladies and gentlemen is the phase that defines the successful from the unsuccessful. Professionals stick to the schedule, while amateurs let life get in the way. We will all hit this wall with our pursuit of habits and the fact is that those that succeed have learned that it is important to show up even when you don’t feel like it. In fact, the best thing you can do is learn to fall in love with boredom. Additional Wisdom from the Book…. If you enjoyed McKell’s recap of the book and want to read further, check out Atomic Habits, by James Clear on Amaon.